A friend mentioned yesterday that very few generations can compare to Generation X's love for its past. This is why you're now forced to watch movies about toys we played with as children. This is the Rad Rabbit Recommends: 80's Edition. Take a breath before you start spewing about how Star Wars started in the 70's. You're correct. However, wee Jamie wasn't old enough to appreciate the swagger of Han Solo until Return of The Jedi hit the screen in 1983. 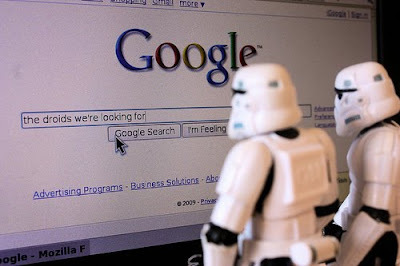 The Stormtroopers 365 photo diary by Stéfan is one of my favorite things on the internet. Especially when the troopers hit the beach. Forgive this trailer its 80's origins by remembering the subject matter. One of my most fabulous movies of all time - Back To The Future. I use the phrase "flux capacitor" on a regular basis. I always think of the color purple when I see Calvin Klein ads. And I'm confident terrorists drive DeLoreans. Plus, my birthdate makes a crucial cameo. A wonderful reason to love a movie. Michael Jackson. A must-include on any great 80's mix tape. And who doesn't need one of those in their hatchback. MJ can best be found on the album The Essential Michael Jackson. So what would you be stoked to find in an 80's time capsule? Please refer to Comment #6 left in error on Desperately Seeking Jamie. Oh so much happened in the 80's. I would love to find my old body in a time capsule. I have missed it so badly!! C: My doll's name was Woody. I think I might still have him.